Whether you can’t kick the coffee/red wine habit or just want to keep the brilliant white you’ve already got, teeth whitening is about as mainstream as beauty practices get. In fact, it’s treated a lot less like an unnecessary beauty expenditure than maintenance. One reason might be that it’s about as unisex of a concern as they get — there’s no good way to hide teeth behind a new haircut. It doesn’t help, either, that they’re right smack dab in the middle of your face. Barring anybody who has spent the last few years doing ventriloquism in Las Vegas, it’s pretty much non-negotiable that your teeth are seen when you speak. The fact of the matter is that we judge people based on our understanding of what is average, and that average has changed now that it’s easier to have whiter teeth. Back when the human race was still getting over how great fire was, likely no one was being shunned for having a little light staining. But now, having nice teeth is almost expected. Professional whitening isn’t in the budget for the everyman, and it doesn’t make the most sense if you’re not going to give up the bad habits or take steps to maintain it after the fact. Many of us use whitening strips, but again, maintenance in between applications is important (otherwise you’ll have to use strips more frequently — spending more money overall and putting more strain on your enamel). For those in-between times, or for sensitive teeth altogether, there’s whitening toothpaste, which doesn’t penetrate deeper into the tooth, but contains an abrasive element that removes those superficial surface stains for you. Great, but which ones of dozens actually work? You probably aren’t going to take pictures of your teeth in the same lighting every day to determine if your money is well spent, and after a while, it’s indistinguishable whether it’s working or you simply believe it is. This is my personal favorite and the one I use. Opalescence is a leader in the Dental Industry when it comes to whitening products. 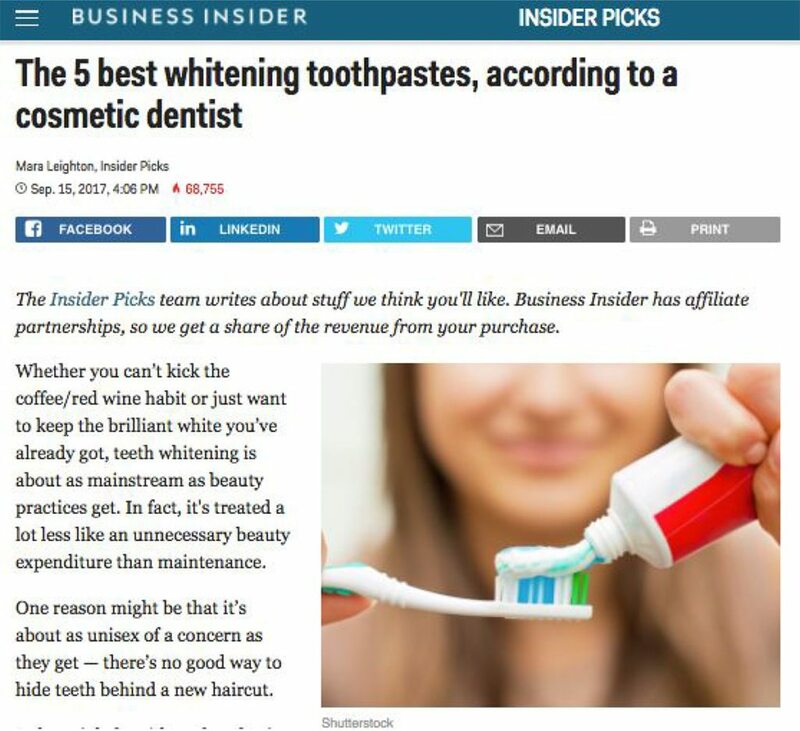 What I really like about it is that its unique formulation has a lower abrasiveness, decreasing the likelihood that it will damage your tooth enamel. The newest whitening toothpaste from Crest is probably the best bang for your buck as it can remove up to 95% of surface stains. This is probably the more popular of the whitening toothpastes since can be found at local pharmacies and drugstores as well as Costco. For those who want an all-natural and fluoride-free alternative, Tom’s of Maine Antiplaque & Whitening toothpaste is a great product. It’s been highly reviewed and contains xylitol. If you have sensitive teeth and are looking to achieve a whiter smile, I would recommend Sensodyne Extra Whitening Toothpaste as it contains Potassium Nitrate which helps relieve sensitivity fast and usually has an effect that lasts 24 hours. A baking soda- and peroxide-based toothpaste that adds another element of whitening as the peroxide can lift stains and whiten your teeth.